All I could think while wearing this sweater was that I want to live in this sweater! In fact, while playing guitar I sang the Death Cab for Cutie song like this: I want to live, where soul meets sweater... I know, I'm a huge dork! I actually think I could be happy wearing this whole outfit once a week. 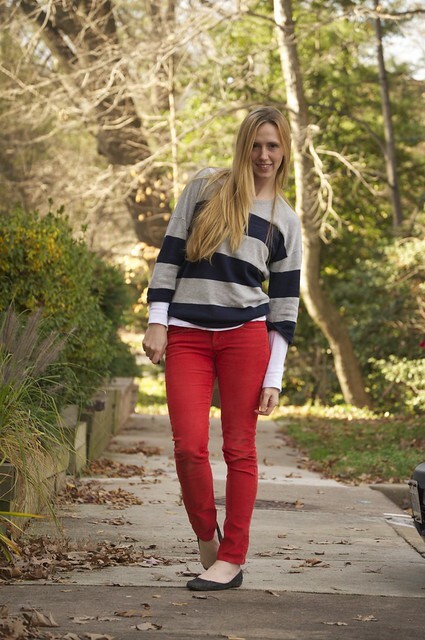 I mean, who doesn't love red pants and stripes? I'm definitely packing this sweater for Grand Cayman, because I think it'll go really nicely with my J Crew shorts on cooler evenings! Other than that, I plan on being in a bikini in the sun the entire time I am there. I really can't wait!